Take care of fevers the easy no medication way with Be Koool. You can win this great prize pack, and fight fevers! 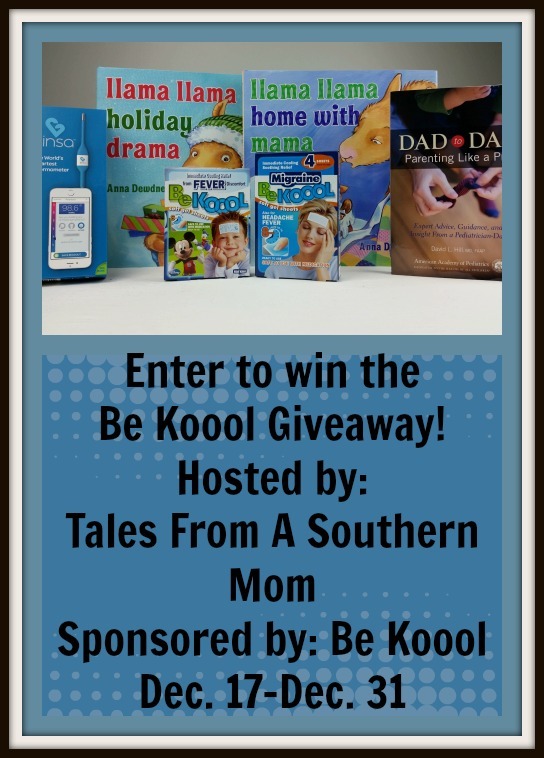 Read a review of the Be Koool Gel Strips here and be sure to enter below to win the following! BeKOOOL Soft Gel Sheets for Kids: Single-use gel sheets for kids that provide immediate cooling relief from fever for up to eight hours. BeKOOOL Migraine: Single-use cooling gel sheets that provide immediate soothing relief from migraine headaches. Kinsa Smart Thermometer: Kinsa builds app-enabled thermometers that offer peace of mind by remembering illness details, and guiding you on next steps if fever and symptoms are cause for concern. Dad to Dad: Parenting Like a Pro: Expert advice, guidance, and insight from pediatrician-Dad, Dr. David L. Hill. Llama Llama Holiday Drama & Llama Llama Home With Mama: With short and simple rhyming text, the Llama Llama books are perfect for educating and entertaining kids.